AleaSoft offers European market price forecasting at the short term. Price forecasts have a 10‑day horizon and hourly granularity. Short term price forecasting is essential for any day-ahead market player: generators, direct consumers, retailers, energy traders, etc. Demand, that uses explanatory variables such as temperatures, calendar data and socio-economic variables. Price forecasting takes into account forecasted prices from interconnected countries, and optimize the price forecasts using the available capacity of the international interconnections. The short-term price forecasting service consists of three automatic daily deliveries, including holidays and weekends, for each market. First delivery: before the market closing for offers. Price forecasting: hourly values up to 10 days (240 hours), from D+1 to D+10 (being D the present day). Forecasting of the explanatory variables up to the same horizon. Second delivery: once the market results are published. Market results for D+1 and the comparison the received forecasts. Price forecasting: hourly values from D+2 to D+11. 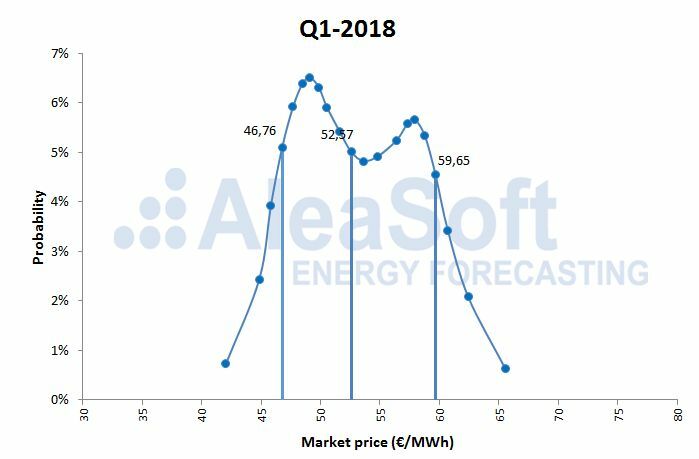 AleaSoft offers mid-term price forecasting for European markets. The price forecasts have hourly granularity, a 3-year horizon and include probability distributions (stochastic forecasts) for each period (month, quarter and year) within the forecast horizon. Stochastic price forecasting allows analyzing the impact of the variability of the explanatory variables in the mid-term price forecasts, and it is a basic tool for risk management and the determination of Values-at-Risk. Demand (obtained from stochastic temperature forecasts). For each of them, its intrinsic variability is estimated based on its historical values. A sufficiently high number of random forecasts is calculated for each of the explanatory variables (coherent between them). With these simulations, the market price simulations are calculated, and from them the percentiles of the price distribution are obtained. Stochastic forecasting will be generated using all registered data available at that time. The delivery will include the probability distributions for each month, quarter and calendar product that is currently being traded in the futures markets and within the forecast horizon. For each period, the distribution will include a reference to the last settlement prices in the futures markets. The mid-term price forecasting service consists of a periodic delivery of the forecast for each market in Excel 2007 format. It will be supplied via FTP or email to the desired distribution list, as an attachment. Market price forecasting: hourly and monthly values up to 3 years. Mean scenario of the main explanatory variables: monthly values. Probability distributions of market price forecasts for months, quarters and years (percentiles 1, 5, 10, 15, 20, …, 90, 95, 99). Fossil fuel prices (Brent, coal and gas). 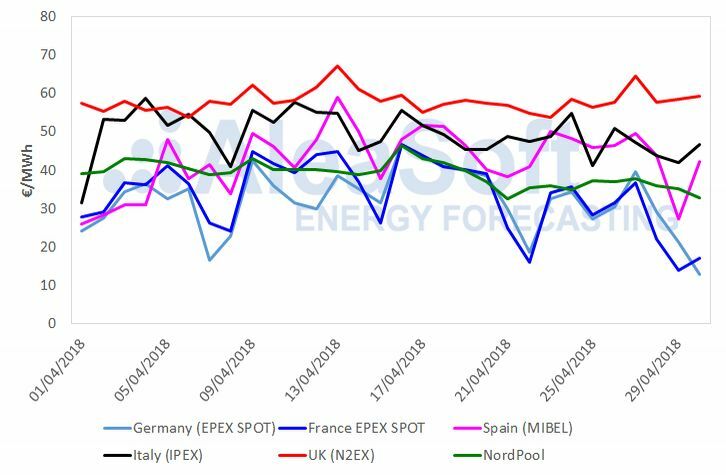 In addition, plans to increase the interconnection capacity between the main European electricity markets are taken into account and thus the convergence of market prices is taken into account. Forecasts are generated using all registered data available at that time. The forecasts take into account the scenarios for the dissemination of new and existing technologies (electric vehicles, batteries, self-consumption, heat pumps, etc.) and their impact on the demand volume and the hourly profile of the price curve. The forecasts include the maximum and minimum confidence bands with annual granularity. The calculation of the bands is made using a sufficiently large number of price simulations generated from random simulations of the explanatory variables, taking into account the probability associated to each simulation of the variables. The variability and the probability of occurrence of each simulation of the variables is be determined by their past behavior and by the realistic future scenarios of the variable. In a PPA (Power Purchase Agreement), having reliable price forecasts at the long-term is essential for all parties involved: investors, manufacturers, installers, managers, producers and consumers. The long-term price forecasting service consists of a single or periodic delivery of the forecast for each market in Excel 2007 format. It will be supplied via email, to the desired distribution list, as an attachment. Market price forecasting: hourly and annual values up to 20 years. Mean scenario of the main explanatory variables: annual values. Description of the scenarios of the main variables. Assumptions made about the long-term market conditions.